I was reading a Bengali magazine yesterday where the last page is earmarked for readers sharing the bitter and sweet experiences of their lives in a letter. I came across a heart-rending experience of a woman, abandoned by her husband of 15 years, because of an extra-marital affair the husband developed with his secretary. She mentioned the date even when her husband broached the subject of divorce. She described herself as a very ordinary woman without any college or university education, had an arranged marriage in which, she said, she tried to fulfill all the responsibilities of a wife. In fact, she never imagined in her wildest dream that she could be a divorcee. She was not aggressive to claim lump sum alimony from her estranged husband and so gave an easy divorce to him demanding only a meagre amount of money for raising their son aged 12 years. Meanwhile, homeless she went to stay with her younger sister and her husband. She was good in stitching and embroideries. So she went door to door begging for work and made a lot of struggle to start a business where she collected orders for stitches. This way she raised her son. Her son after passing the matriculation exam stopped taking money from his father. In the meantime, her business was doing well enough for her to shift to a rented home from her sister's house. Her son also completed graduation in hotel management and got a good offer in a five star hotel in Dubai. He went to Dubai and she started to feel very lonely when one day she found her ex-husband standing at her door in a very frail condition. Her ex told her that he was suffering from prostate cancer and got divorced by his second wife with whom, he claimed, he never found happiness. Now he wanted to spend the last few years of his life with his former wife and their son. She gave him shelter in her house. This action made her son furious, but she reasoned that she understood the state of being helpless and so out of sympathy she was helping him. Soon about a year later, the husband died. Now she shuffles between Kolkata and Dubai and is quite content to have seen the full circle of her life. It left me really amazed at the inner strength of the woman who not only did survive and overcome the frustration and trauma of a broken marriage, but had the heart of gold to forgive so easily her selfish husband who didn't think twice before leaving her in the lurch for another woman. Hats off!! 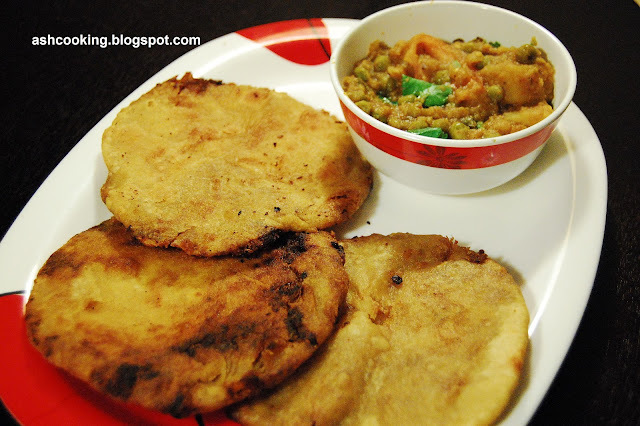 Back to the recipe, Badhakopir Kachuri is really an awesome snack or breakfast item to have. Personally, I would prefer it for lunch as I find light breakfast suitable for me. 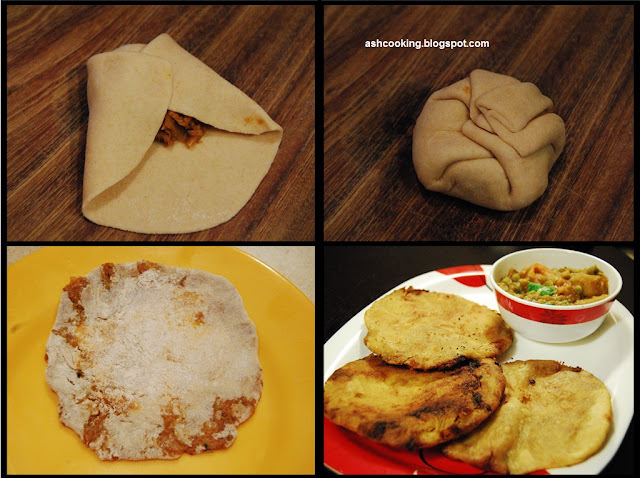 Ingredients :( make 9-10 kachuris) Cooking time: 1 hour approx. Note: I have fried the kachuris in white oil, but I have used mustard oil in cooking the cabbage filling. You may use white oil throughout or you may combine both. 1) Mix in a pinch of salt and turmeric powder with the cabbage and boil till it becomes mushy in texture. (I cooked it in pressure-cooker with one whistle.) Then drain the water and mash the cabbage. Squeeze any remaining water out of the cabbage. It must be dry while being cooked. Keep aside when done. 2) Combine the flour in a mixing bowl and add a pinch of salt, sugar and a bit of oil. Incorporate them well with the flour (Don't add water about this time. This step is important because it will make the kachoris puff up.) Then gradually add required amount of water to knead dough. Keep aside when dough is kneaded. 3) Now heat oil in a non-stick pan. Add onion paste and shallow fry till it becomes translucent in color. Add ginger and garlic paste. Combine. Add the cabbage followed by the spices - turmeric powder, cumin powder, coriander powder and dry red chilli powder, salt and sugar. Mix them well and cook on medium heat for 10 minutes till all the ingredients are assimilated. Finally, before turning the heat off, sprinkle garam masala powder and stir in to mix. The cabbage stuffing is ready. 4) Make small balls out of the dough. Using a rolling-pin, roll each ball out into circular shape as shown in the pic. Put spoonful of cabbage filling in the middle of the pancake. 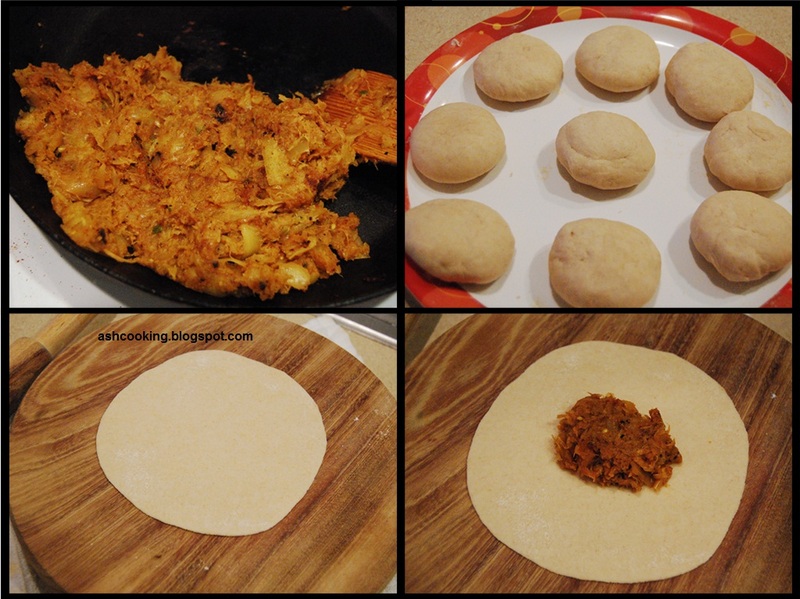 Fold the sides and dredging them generously with flour, roll again into the shape of kachuris. 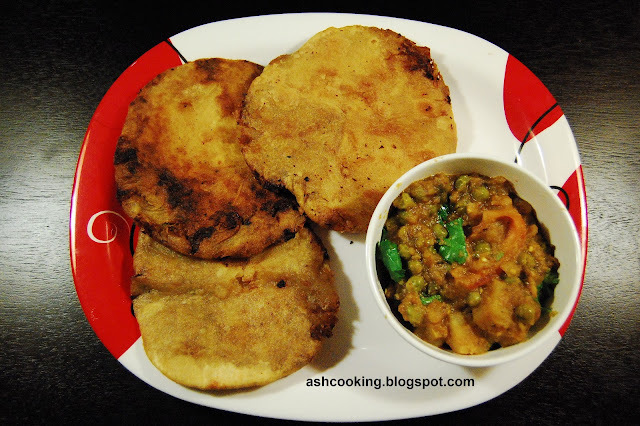 5) Deep fry the kachuris. Serve them with any favourite curry of yours.